For all of our trips you will be parking at 205 E. Seventh St. (US-10). All trips leaving from our location at US-10 (205 E. Seventh St) are Anytime Trips. 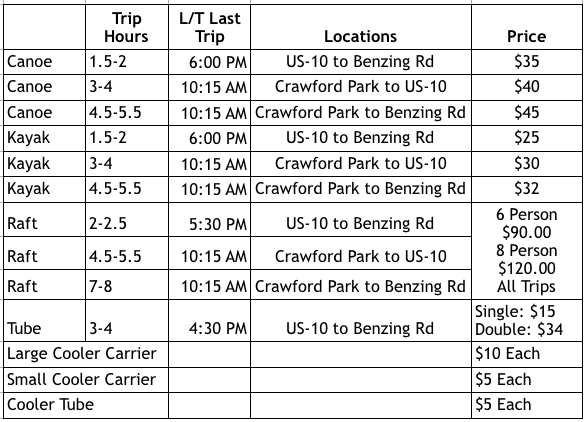 Longer trips, leaving from Crawford Park are considered our Scheduled trips and can end either at our US-10 (205 E. Seven St) location or at our location on Benzing Rd. For more information regarding these trips, please see the appropriate section below or reserve online now. Anytime Trips allow our guests to get into the river quickly upon their arrival, and also allows them to choose their own departure time (up until last trip of the day allowed L/T ) These trips launch from our US-10 location, with the trips ending down river at our Benzing Rd. location. Note: on weekdays (if you have a cell phone) we will provide you with a waterproof case so you can call us when your trip ends. If you do not have one we will arrive at the approximate trip ending time. On weekends workers will be there so a phone won't be necessary. Note: if you will need towels or other items waiting for you when your trip ends, leave these items with our worker when you register at our US-10 location. These items should be placed in bags but if you do not have any we will provide them. Scheduled Trip Times: 9:15 & 10:15. We do not allow scheduled trips on Sunday. For all of our scheduled trips; our guests will be taken up river to M-66 where they will launch from Crawford Park. From there, you will either float back to your parked vehicle at our US-10 location or you will float past our US-10 location and will continue on until you reach our second location on Benzing Rd. Additionally, if you choose to go to Benzing Rd, please bring a cell phone to call when you near your destination. If you do not have a waterproof cell phone case we can loan you one. For guests wanting to take one of our scheduled trips, we have a minimum of 2 canoes or 3 kayaks required. If you do not meet these requirements you may still be able to go, by calling to find out if we are going to be taking another group out. You can call us and schedule an appointment, or even just call ahead (giving us one hours notice before your arrival) but only having a reservation guarantees you the equipment you want will be available on the day of your trip. It is extremely helpful to us with the registration process (and reduces your wait time), when groups can have their payment ready upon their arrival, (paying with one payment for their entire group), and can also have their waiver signed in advance. The waiver must be signed by (all adults 18 yrs. or above) Parents or guardians must also fill out the consent area of form for all minors (age 17 or below.) Our waiver can be found on this website under the waiver tab. Leave towels and dry clothing waiting in your vehicle for the end of your trip. We require all children 10 or below to wear a life vest. We ask that all of our guests be off the river by 8:00 P.M.
Michigan state law; Absolutely no glass or Styrofoam allowed on the river! Bring plastic or cans only! We reserve the right to check coolers. Alcohol is discouraged, but not prohibited. Note: Weekends can be busier for trips launching from Crawford Park, as another canoe livery uses this park also. The other canoe livery paddlers will drop off about half way between Crawford Park & Riverside Park, (so river traffic should diminish considerably after that). Trips leaving from US-10 will be floating past Riverside Park (beginning of trip) and will most likely be floating past a few sandbars, so you may want to plan a stop.